The study initially enrolled 5,815 patients admitted to 13 intensive care units in the United States from 1979 to 1982. Initially, the authors did not plan to exclude any patients; however, CABG patients (N=785) were later excluded, resulting in a total patient population of 5,030. The authors excluded CABG patients because surgical and anesthetic management resulted in falsely elevated APACHE II scores despite a low mortality rate of 1.5%. The APACHE II score is made of 12 physiological variables and 2 disease-related variables. Within the study period, 87% of all ICU patients had all 12 physiologic measurements available. The worst physiological variables were collected within the first 24 hours of ICU admission. The "worst" measurement was defined as the measure that correlated to the highest number of points. The study did not continually calculate an APACHE II scores beyond the first 24 hours of ICU admission. The APACHE II score ranges from 0 to 71 points; however, it is rare for any patient to accumulate more than 55 points. The study did not have a pre-defined validation population, so validation occurred within the original training group. The area under the ROC curve in the entire population was 0.863 (no confidence interval provided), which was similar to the previous APACHE system of 0.851, but required 34 physiologic variables. Additionally, APACHE II provided an R2 of 0.319 (previously 0.310 with APACHE) and rank correlation (R) of 0.739 (previously 0.730). 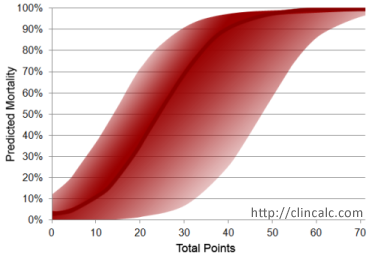 The image below shows that there is a sigmoid relationship between mortality and total APACHE II score. The graph includes a solid red line, which represents mortality without correction for the patient's ICU admission indication. The red gradient encompasses the potential mortality risk depending on the patient's ICU admission indication (drug overdose being the best, respiratory neoplasm with emergent surgery being the worst). Kane SP. Acute Physiology and Chronic Health Evaluation (APACHE II) Calculator. ClinCalc: https://clincalc.com/icumortality/APACHEII.aspx. Updated November 10, 2018. Accessed April 20, 2019.